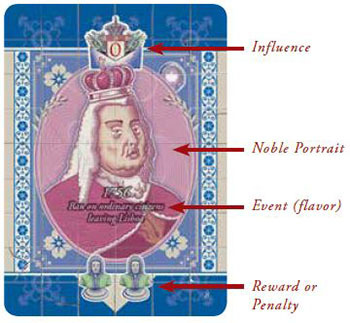 Each Noble card depicts one of the 3 Nobles in the game, with an envelope at the top, representing Influence, and a reward / penalty on an arrow at the bottom. 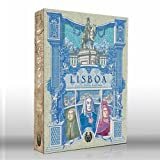 Noble cards represent a political event in which you engage with one of the Nobles. You can play this type of card in the Royal Court to visit the Noble, or into your Portfolio for the reward and for future Influence. Each Treasury card has 2 treasury icons at the top. One with an arrow and another with a real with a plus sign. 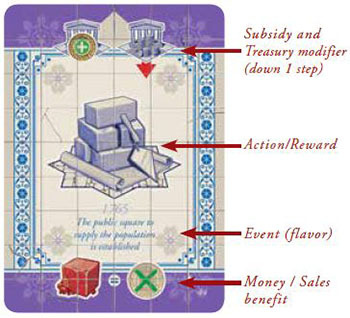 It also has an icon of an action/reward in the middle, and a money/sales benefit at the bottom. Treasury cards represent a subsidy from the Royal Treasury to you. You can play this type of card in the Royal Court for the action/reward, or you can play it into your Portfolio to take a subsidy from the Royal Treasury and gain a permanent money/ sales benefit.